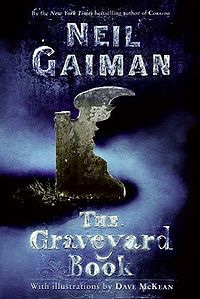 If you’re a fan of Harry Potter, you probably will love (and may already know about) Neil Gaiman’s The Graveyard Book. When I picked it up, I didn’t realize it was young adult fiction. If you read here, you know that’s not my genre (Harry Potter aside, which I’m reading purely because of my nephew). And, I almost took out the CD when I heard “HarperCollins Children’s Audio,” but I’m quite glad I didn’t. As fair warning for those with children, this story starts out quite dark with a pretty descriptive scene of a man in black with a sharp knife who is walking through a house after killing the mother, father and one child. He is looking for the youngest child – a boy toddler – who was actually his intended victim. The toddler, not knowing he’s in danger, climbs out of his crib and wanders out of the house, up the street to the nearby cemetery. This is how Nobody Owens is adopted by two elderly ghosts who never had a child of their own. “Bod” (as he is known) enjoys a protected childhood where he has full access to the graveyard, is doted on by most of the spirits who live there and is cared for by his guardian Silas – who’s form is never fully disclosed, but is strongly suggested he’s a vampire. The story is the mystery of why Bod was (and still is) the target of such a crime. But it is also a coming of age story. As Bod gets older, he wants to explore life outside the graveyard – something that he knows is dangerous but is nonetheless intriguing. There are many teaching opportunities within the story line about earned privileges and growing responsibility as Bod does explore life outside his safe zone and tests the waters of unfamiliarity. A note on the audio version, Gaiman reads it, and his voice is marvelous! Not a gift all authors have. This is a book that would do well to be read (or listened to) jointly by parent and child. And, because of the wit and creativity of dialogue, characters and setting, it should be equally enjoyed by both. I need to try the audio version of this some day – I so enjoy Neil Gaiman's reading. I'm really glad you liked it, Elisabeth. The growing up and making the transition from that safe zone to to the big wide world angle was what spoke to me the most, but it's a story that can be appreciated on so many levels. I love this book! I first "read" it as an audiobook when I had temporary double vision and couldn't read. Gaiman's voice truly is marvelous. I am so glad you liked this audio book, Elisabeth. I am next in line to listen to it from the library, and I really look forward to it. I agree wholeheartedly. Gaiman's recording of his book is amazing. Hey, all – Thanks for your comments here… sorry I haven't paid attention to the blog & have relied on email for comments…and I just saw they've been going to spam. I can't say how this is reading, but Gaiman's voice makes the audio version pure pleasure! Share book reviews and ratings with Elisabeth, and even join a book club on Goodreads.